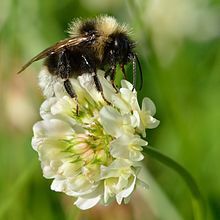 Trifolium repens, the white soukie or trefold, is a species o clover native tae Europe, North Africae, an Wast Asie. It haes been widely introduced warldwide as a pastur crap, an is nou common in maist grassy auries o North Americae an New Zealand an aw. White clavers is pairt o the pease faimily Fabaceae. The genus name, Trifolium, derives frae the Laitin tres, "three", an folium, "leaf", cried that name acause o the characteristic furm o the leaf, that haes three leaflets (trifoliate); that's hou it gets the popular name triffle. The species name, repens, is Laitin for "creepin". It is a yerbaceous, perennial plant. It is laich growin, wi heids o whitish flouers, aften wi a tinge o pink or cream that mey come on wi the agin o the plant. The heids are generally 1.5–2 cm wide, an are at the end o 7 cm peduncles or flouer stalks. The leaves, which bi themselves furm the seembol kent as shamrock, are trifoliolate, smuith, elliptic tae egg-shapit an long-petioled. The stems function as stolons, so white claver aften furms mats, wi the stems creepin as muckle as 18 cm a year, an ruitin at the nodes. White claver graws amang turfgrass, craps, an in a lairge nummer o ither laundscapes. It is foond in a leemitit range o different field type environments an aa. White claver can tolerate close mowin, and can graw on mony different kins an pHs o soil, but prefers clay. It is considered tae be a beneficial component o naitural or organic lawn care due tae its ability tae fix nitrogen an oot-compete lawn weeds. Naitural nitrogen fixin reduces leachin frae the soil an can reduce the incidence o some lawn diseases that is enhanced bi the availability o synthetic fertilizer. Asides makkin an excellent forage crop for fermstockin, clovers are a valuable survival fuid: they are heich in proteins, widespread, an abundant. The fresh plants hae been uised for centuries as additives tae salads an ether meals consistin o leafy vegetables. Thay arenae easy for humans tae digest raw, housomever, but this is easy fixed bi boilin the harvestit plants for 5–10 minute. Dried flouerheids an seedpods can an aa be grund up intae a nutreetious flour an mixed wi ether fuids, or can be steeped intae a tisane. White clover flour is sometimes sprinkled ontae cuiked fuids such as boiled rice. When uised in soups, the leafs is aften harvestit afore the plant produces flouers. The ruits is edible an aa, tho thay are maist aften cuikit firsthaund. Afore the introduction o broad-leaf yerbicides, white clover wis mair eften addit tae lawn seed mixes than it is the day, as it can grow an provide green cover in puirer soils whaur turfgresses dinnae perform weel. Mony fowk consider claver a weed whan growin in lawns, in pairt acause the flouers are attractive tae bees and thus could create a danger for fowk wi bare fit. White claver is the anly kent plant on whilk the caterpillars o the Coleophoridae case-bearer moch Coleophora mayrella feed. In Breetain, a heich abundance o white claver is generally associatit wi species-puir, agriculturally improved grasslaund habitats, as it ootcompetes the mair rare plants an grasses enspecially in fertile soils, an haes aften been addit as pairt o reseedin. Agri-environment schemes, like the Kintraside Stewardship Scheme, Environmentally Sensitive Auries Scheme, an Environmental Stewardship, gie fundin tae species-rich gresslands that is relatively infertile an dinnae generally hae an abundance o white cloaer. Housomever, white claver daes hae value as a pollen an nectar soorce particularly in intensively fairmed auries or amenity grasslands whaue thare few ither flouers, an it can be foond naiturally at laich levels in species-rich grasslands. ↑ 1.0 1.1 1.2 1.3 Richard H. Uva, Joseph C. Neal and Joseph M. Ditomaso, Weeds of The Northeast, (Ithaca, NY: Cornell University Press, 1997), Pp. 236-237. ↑ The Organic Lawn Care Manual, Tukey, Storey Publishing. p 183. ↑ Lee Allen Peterson, Edible Wild Plants, (New York City: Houghton Mifflin Company, 1977), P. 56. Wikimedia Commons haes media relatit tae Trifolium repens.